Hey, everyone! Once again, as usual, I am working on a secret project that keeps me from blogging about my current work. The good news is that it is the coolest secret project I have worked on in a while, so when I can blog about it in a few weeks, I think everyone will find it very exciting. 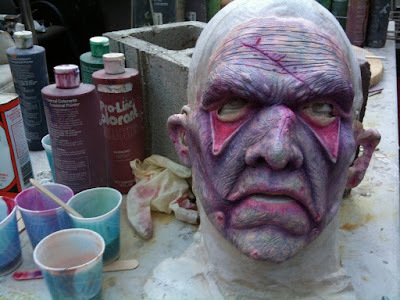 But I did want to make an entry, so in honor of Eric McNeely’s birthday, I thought I would show you how I made the Fallbrooke front man’s Halloween costume! 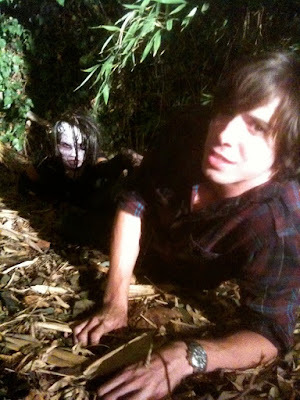 Photo 01: Here’s Eric as he usually looks, loving every second of being attacked by a zombie during the video filming. 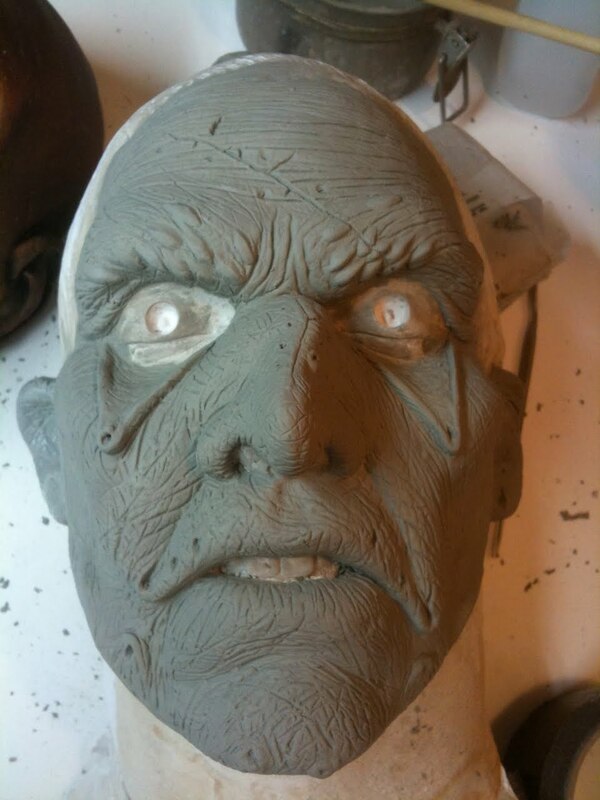 Take a good look, ladies…this will be the last time you see him like this during this blog! Photo 2: Told you! 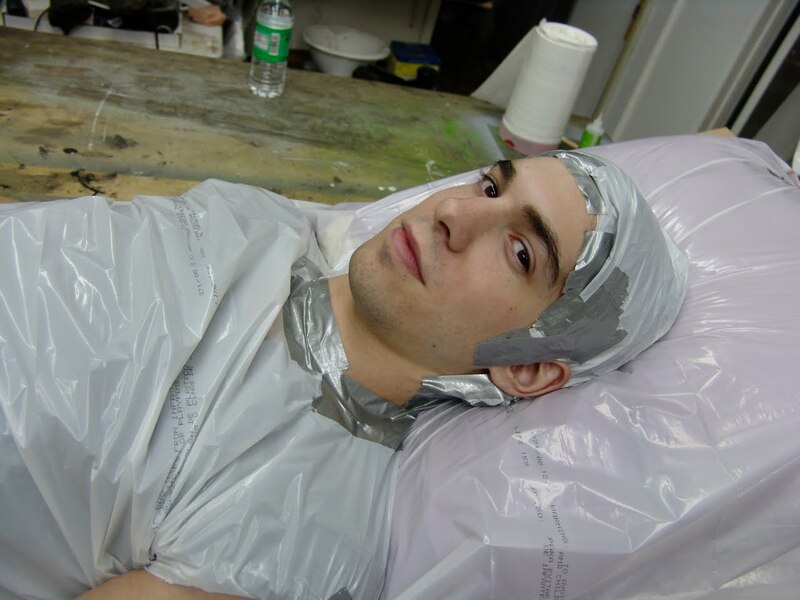 I would imagine that you will never see Eric on stage with a plastic bag on his head! But that’s what happens here at the BarnYard! 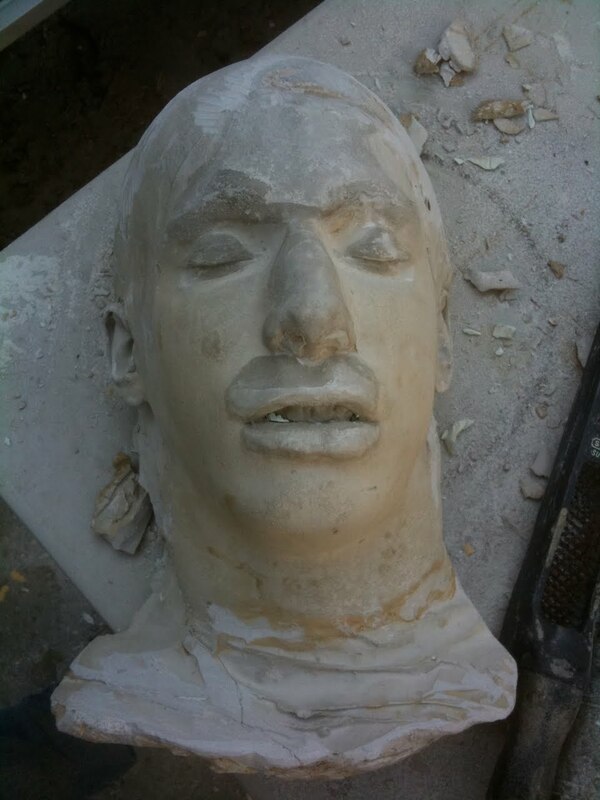 Eric is prepped for a face cast. 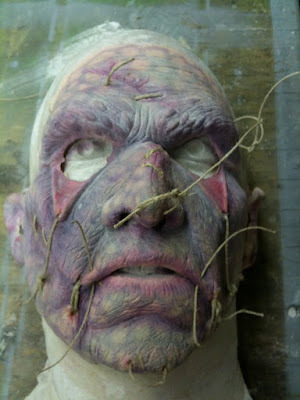 I will be using dental alginate and plaster bandage to make a negative of his face. 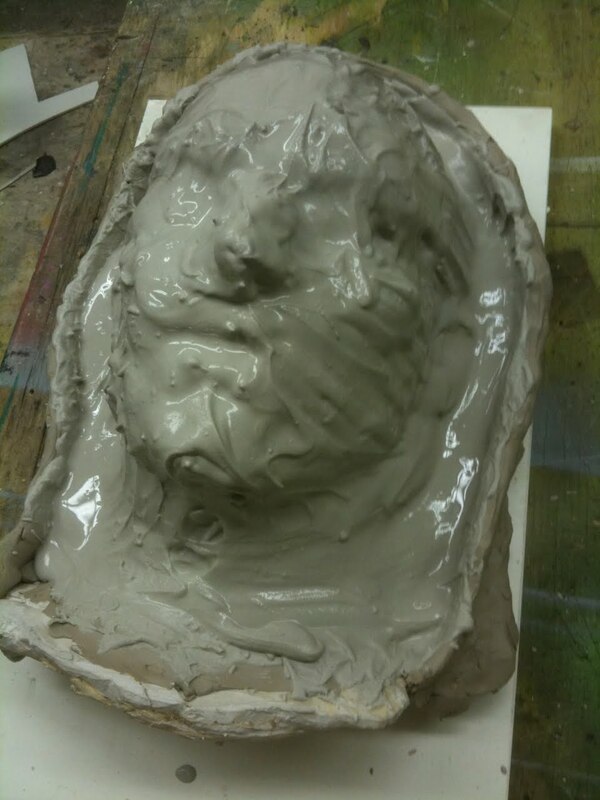 Photo 4: Here’s the plaster positive I pulled from the alginate face cast. The dark areas are retaining moisture, and the whole thing needs to be baked in an oven for an hour or so to make the clay stick better. 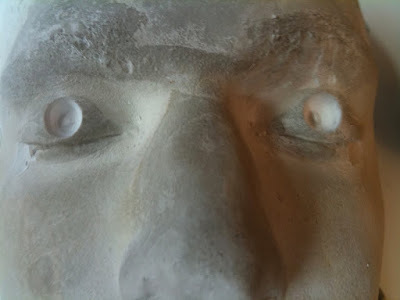 Photo 4a: Before I add clay, I dremeled out negative “keys” in the eyes. These will help the mold register better, especially since I don’t have the time to build a flange like I did in the Zombie School steps. It’s a good idea to do this first, because you risk ruining your sculpture going in with heavy tools after it’s done! Photo 5: I’m designing as I go, so I just started with a base of clay on the obvious areas. Photo 6: I usually wonder around my shop and look at old sculpts, magazines, and life casts for inspiration when I am designing. 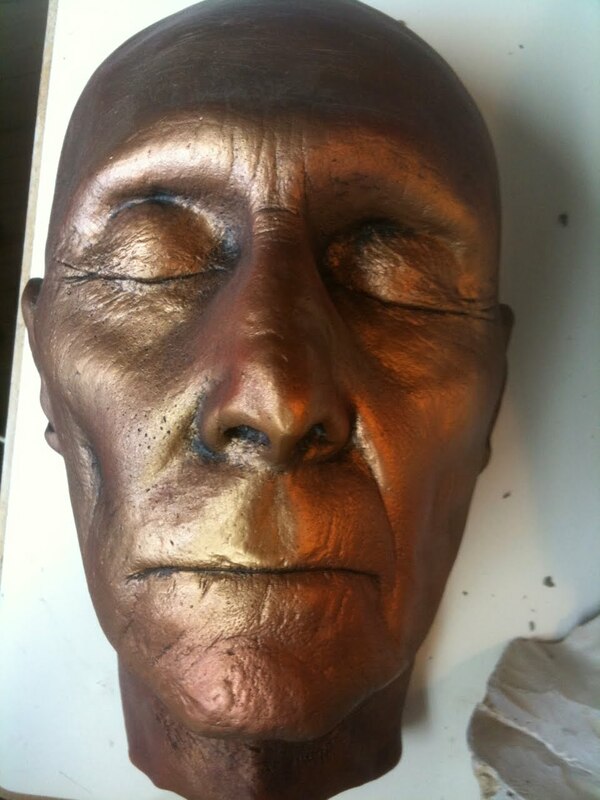 In this case, Peter Cushing, of Hammer films and Star Wars fame, struck me as a cool starting point. 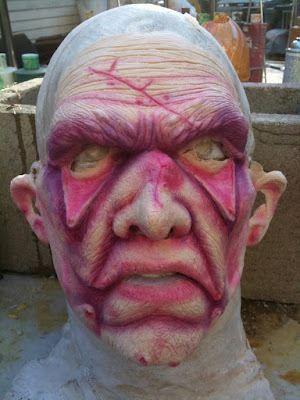 His stark features are the perfect base for transforming a rock star into a horrific vision. 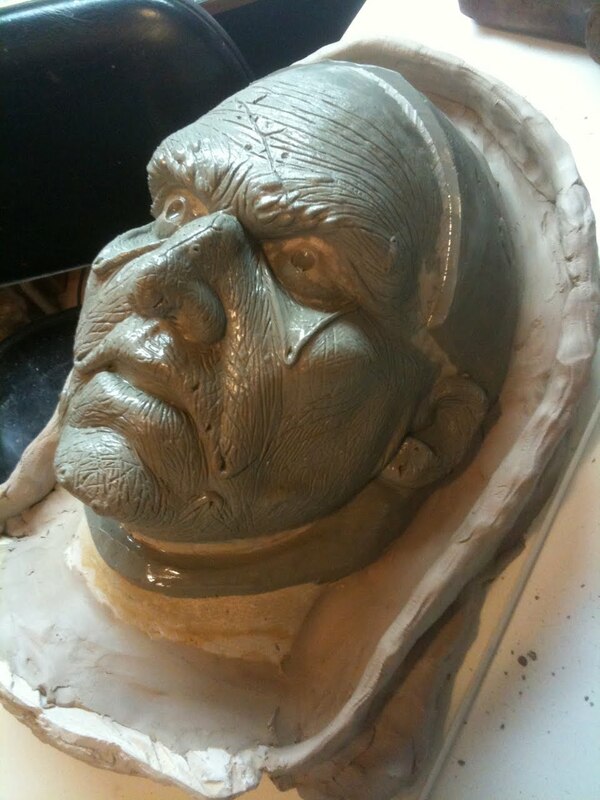 Photo 7: You can see in this photo how I started drafting features from the life cast into the sculpt. Photo 9: I raked the whole surface to even out the overly hand-worked surfaces. Create rhythms and patterns with the rake to help match contours on both sides of the face. Photo 10: After you feel like your surfaces all match, you can smooth down the rake marks with a soft sponge. Then begin the detail work. 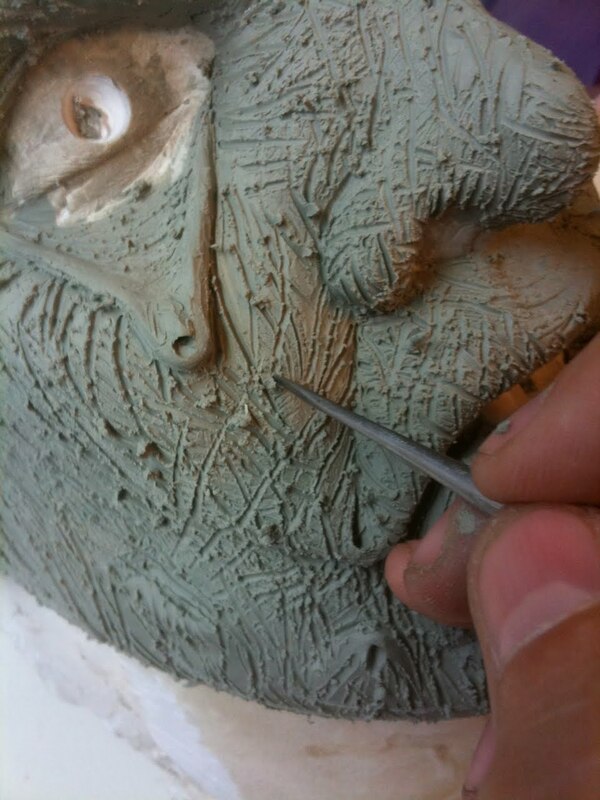 I carve in wrinkle patterns with a wax spatula, starting with following the flow of the features, then doing a second pass going against the flow for contrast. 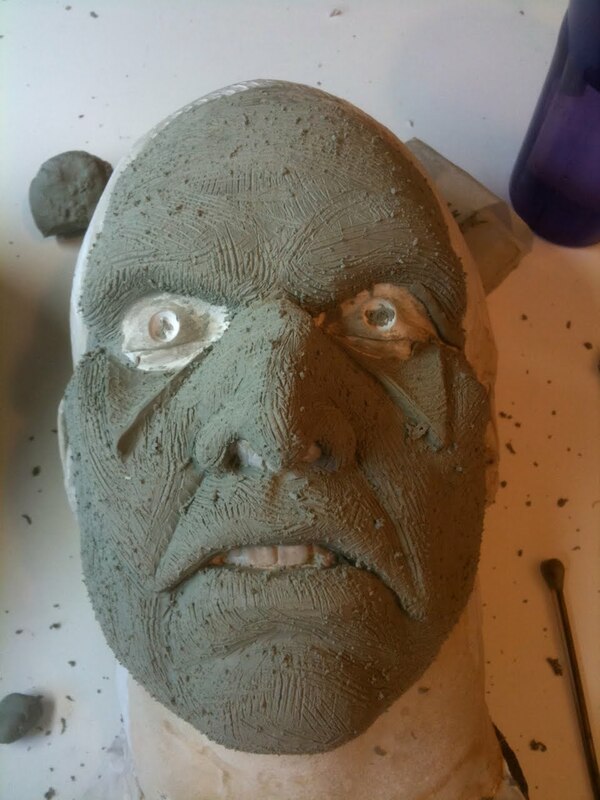 Photo 11: To accent some of the heavier wrinkles, like around the eyes and on the brow, I roll small clay lumps and push them into the wrinkle pattern. Blend in the edges with the wax spatula, then brush them down with alcohol and a stiff brush. Photo 12: I started as a painter, so I do a lot of brush work in my sculpting. 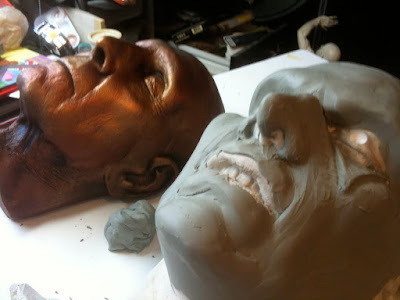 I use the sculpting tools to create the forms and rough in the details, but most of the finished work is done with several brushes, ranging in shape and rigidness. 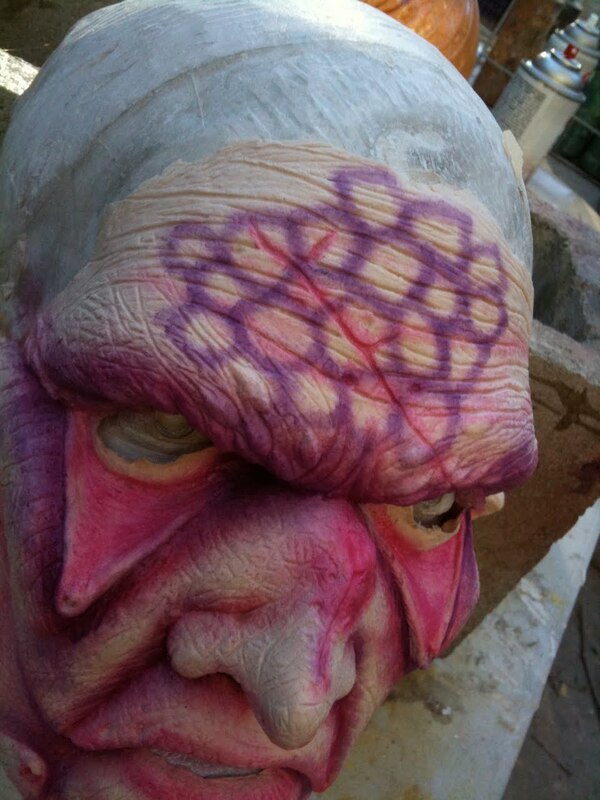 Obviously, the final pass is with smaller, soft brushes to eliminate brush strokes. 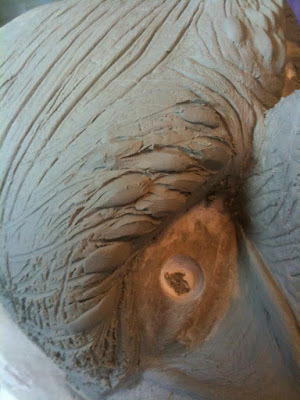 And avoid using TOO much alcohol, as it will make the clay mushy and hard to work with. 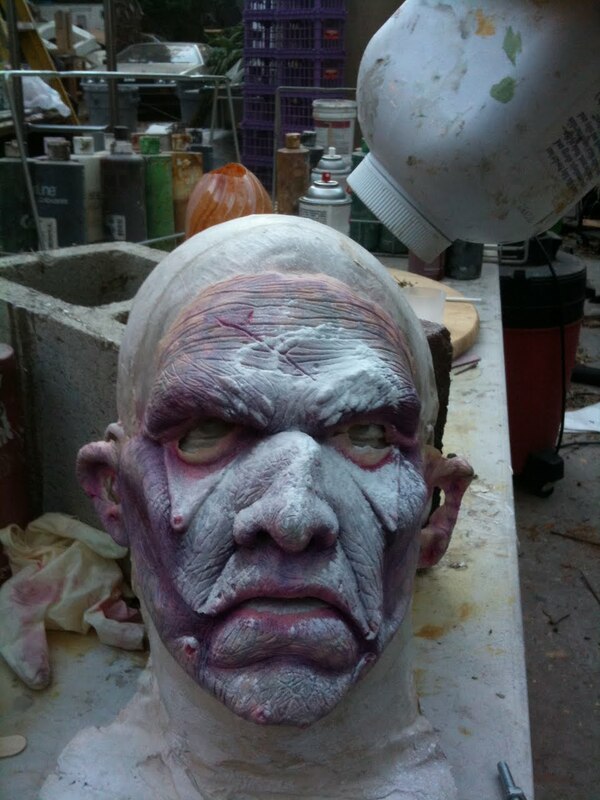 Photo 13: I captured Eric’s ears pretty well in the cast, so it seemed like a good idea at the time to sculpt up some quick, puffy, bruised ears. 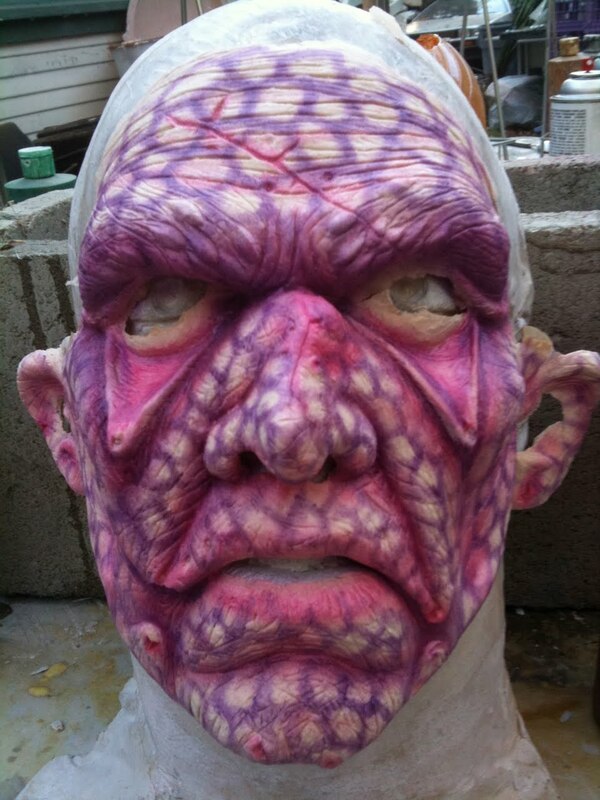 I decided along the way that this face would be stretched and stitched together with heavy twine, so meaty ears that I could sew through will help complete the look. Photo 14: Can you still see Eric in there? The finished sculpt. Just in time for lunch! Photo 15: The next step was to create a “cutting edge”, which entails putting clay over exposed plaster surfaces of the face cast, giving the extra foam and air someplace to escape when the foam latex is run later. 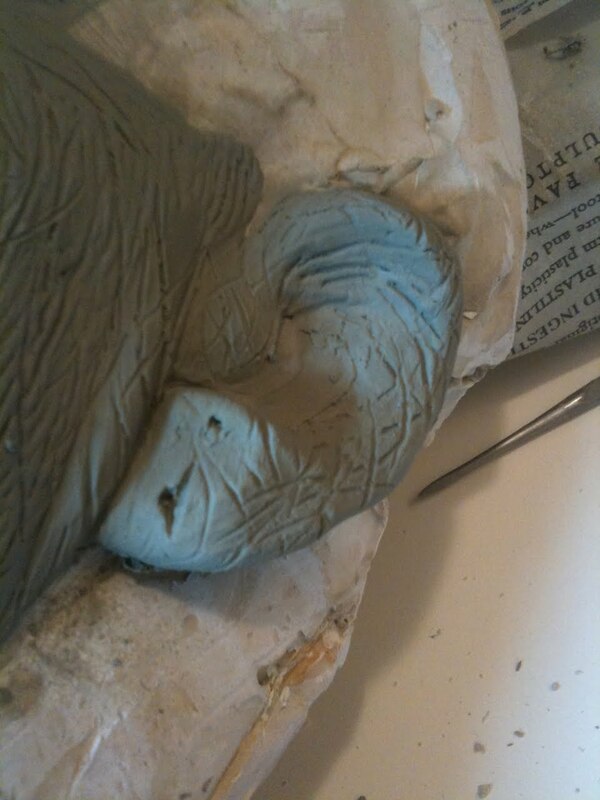 I also threw up a clay wall to make the molding easier, kind of the equivalent of the kiddy rails in a bowling alley! 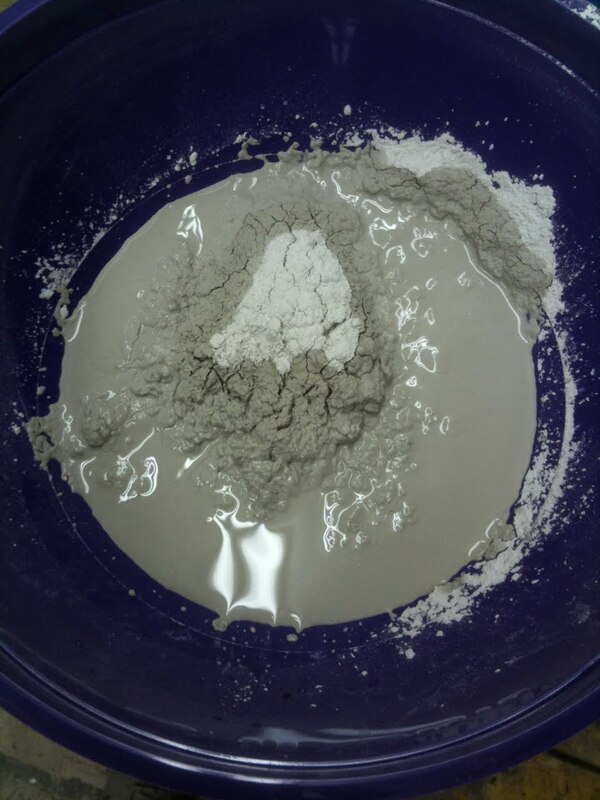 Photo 16: When mixing plaster, it’s recommended to allow the powdered gypsum to soak in the water, rather than mix it in straight away. This is called the “dried river bed” technique. Photo 17: Mix the first batch of plaster to be the consistency of cake batter, then coat the whole sculpture. I usually splash it on, forcing out the air without physically rubbing the surface and risking damage. 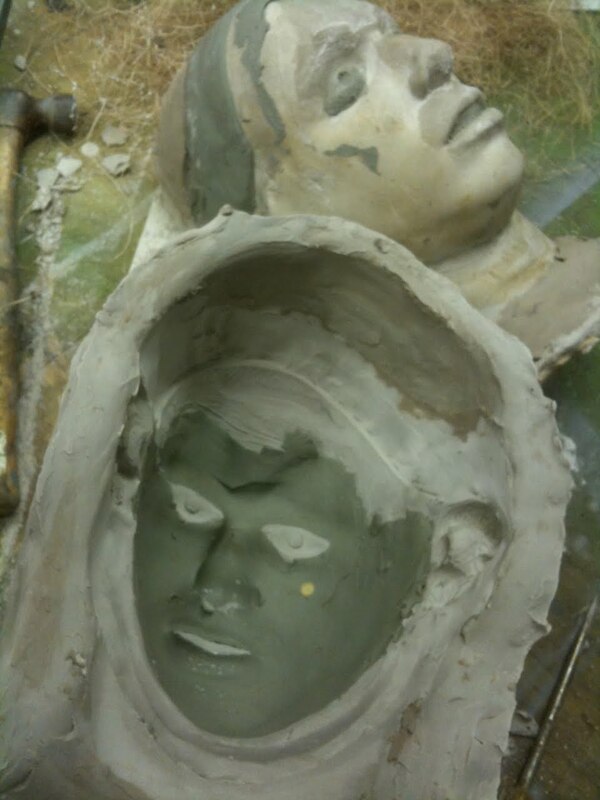 The sculpture is finished, but the clay is still pliable. 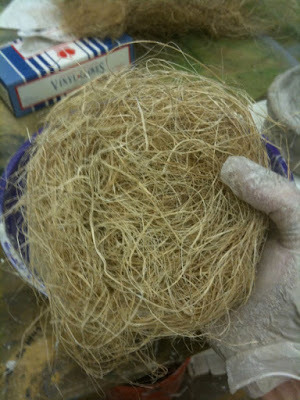 Photo 18: To strengthen the mold, use hemp soaked in plaster. I buy it in bails, which seems to add to the whole “BarnYard” thing! Photo 19: Pull clumps of hemp and roll it into “bird’s nest”. Soak these in the plaster and apply them over the splash coat, overlapping them so there are no weak spots. This step is all in the timing. If you put the hemp on too soon, it will press through the soft splash coat and show up in the surface of your mold. But, if you wait too long, the splash coat will cure and chances are it won’t bond to the hemp coat, ultimately chipping out and ruining your negative! So make sure that your splash coat is firm, but still wet when you get to the hemp! 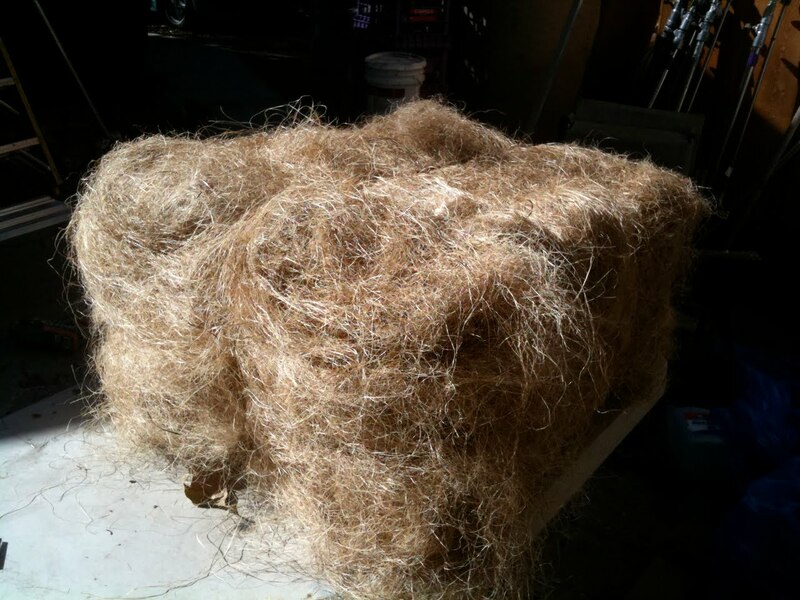 Photo 20: You can put several layers of hemp, but try to keep the overall thickness of the mold to about 1 inch. It helps keep temperature consistency in the foam baking process, which will result in better foam. 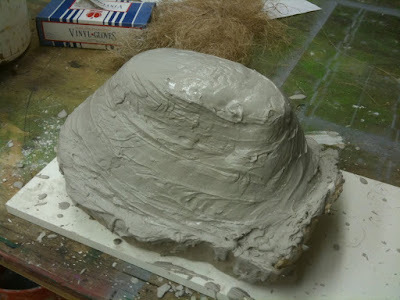 I usually cheat a little on this rule and build up the top to create a flat surface, which makes running the foam easier since the mold won’t flail about when its turned over. 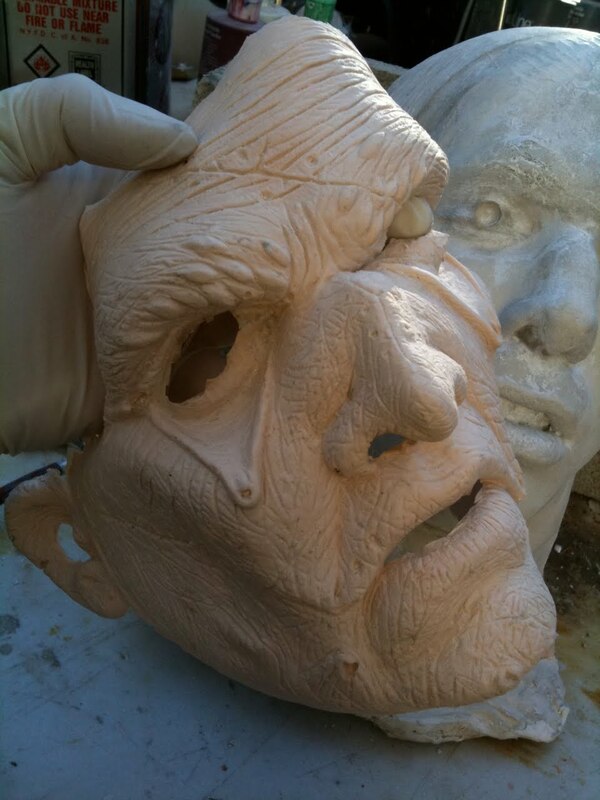 Photo 21: Here is the mold cracked open. 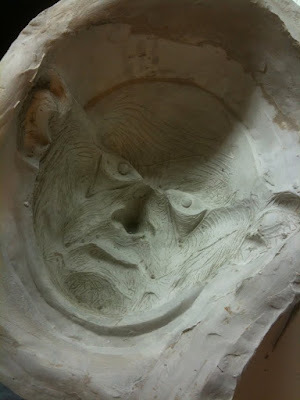 Most of the clay peeled out in the process, but it’s important to scrub the remaining clay from the negative and positive before running the foam. 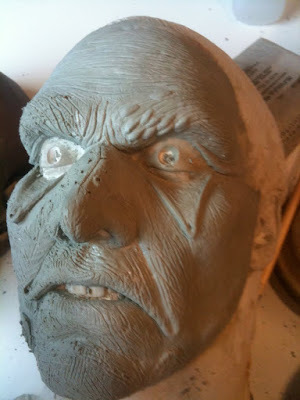 Use alcohol and a toothbrush, or Popsicle sticks snapped in half long ways to dig deep clay out. Avoid using metal tools like the wax spatula, as they will cut into the plaster and add texture you don’t want! Photo 22: Here is the cleaned mold. It looks freaky already, even in reverse! 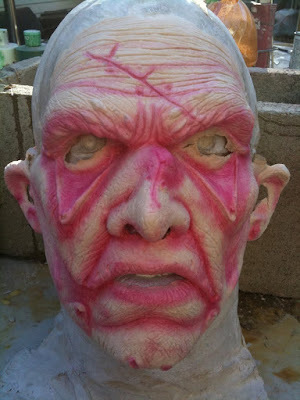 Photo 23: So I ran the mold up to Valencia, and the magical Mark baked it out and nailed the first foam run, as always! He delivered it in the morning, giving me enough time to paint it and still have a lunch date! Thanks, Mark! Photo 24: I wanted this creature to look more bruised than dead, so I started with a bright red rubber cement paint mix in the shadow areas. 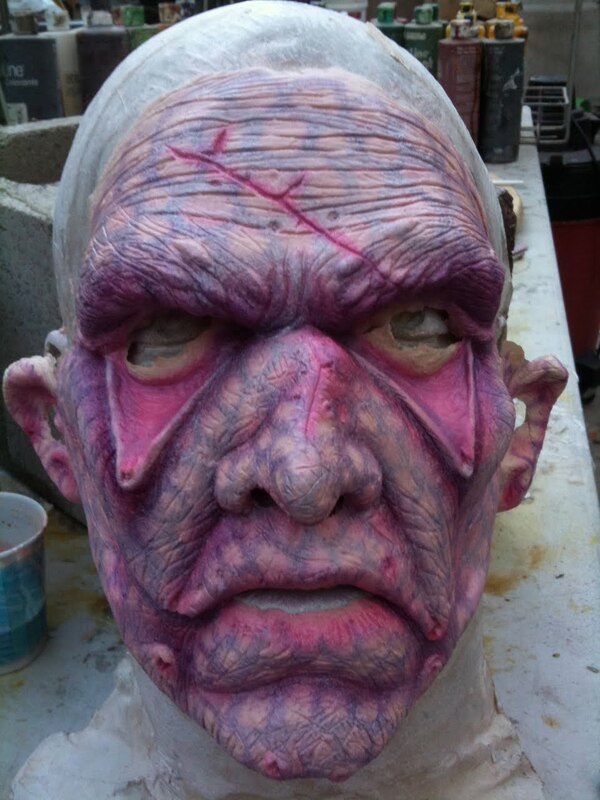 Photo 25: I followed this with purple, darkening the deep shadows, but still letting a lot of the red poke through. Photo 26: Ah, my old stand-by technique: Ringlets! I always tell myself I will try something new, but this approach is really fast, and has never failed me. I used the same purple shadow to airbrush rings, layering the paint to be a little more opaque. Photo 27: You can cover as much or as little of the piece as you want with rings. 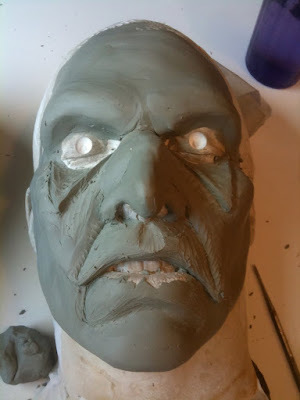 I did the whole thing, making them smaller and tighter in the shadow areas, and widening in the fleshy areas. Right now you probably think this looks pretty ridiculous! Its important to remember that rubber cement is a translucent painting medium, so you have to be thinking about the next layers as you paint the current ones. I went pretty full on with the rings, because the next few layers will reduce their intensity, and I want them to continue to read. It’s a basic pattern, but it will end up reading like veins and capillaries. I applied a few layers of the flesh, and you can see how drastically it changed the ringlets! But now he looks a little too lively! Photo 29: To make him more sickly looking, I layered in a very thin green over the shadow areas. It allowed the reds and purples to stay visible, but cut down on the warmth is a few areas. 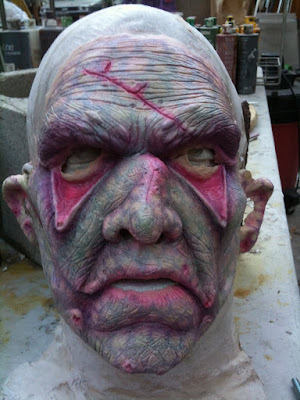 Photo 30: Finally, I accented the inner eyelids, and some of the scars and shadows. I am also planning on doing a bunch of modeling with rubber mask grease paint once the appliance is glued to Eric’s face, so this paint is really just serving as a base. Photo 31: Don’t forget to powder! The paint is still rubber cement, so it will stay adhesive until a layer of baby powder is applied to it. Keep this in mind when painting, also. Touching or folding the foam while you are working on it will cause the cement to bind to itself, and that never ends well! Photo 32: Now that it is not sticky, I poked some holes in the foam and threaded some hemp twine through the stitched areas. Anything that can be done once its glued down I will do later, but I didn’t want to be poking around Eric’s face with a needle if I don't have too! Photo 33: Happy Halloween! Oh, wait. That was weeks ago…Well, it was Halloween when this photo was taken. We started about 6ish, so Eric could be ready for the party circuit. It took about an hour to apply the whole thing. 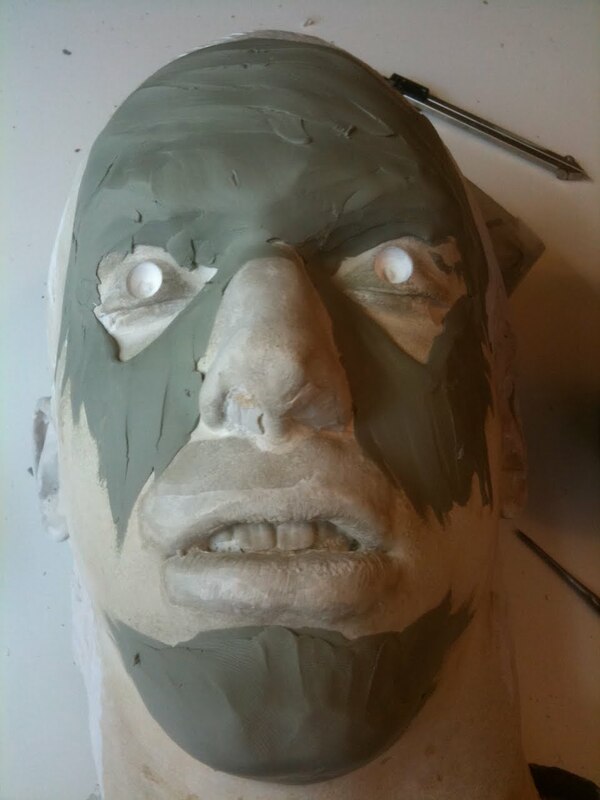 Photo 34: I made some quick teeth out of Magic Sculpt, and tied them onto the loose strings hanging from his chin, brow, nose, and ears. 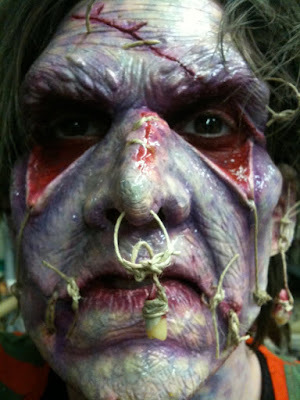 Despite the hellish make over, Eric found this to be the most disturbing part of the whole make-up! 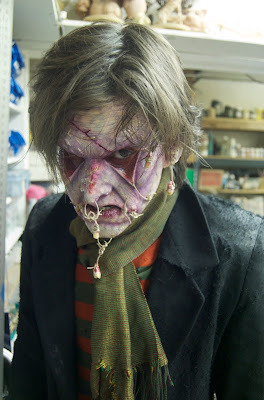 Photo 35: Here he is in all his ghoulish glory! Hopefully he scared the crap out of you if you ran into him that night! 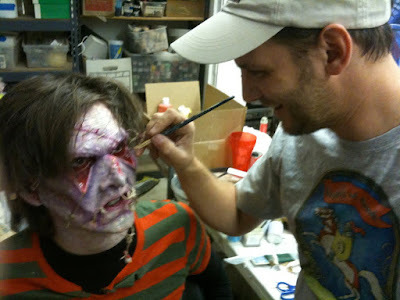 It was a lot of fun to do, and I hope there were a few useful hints in the process for your make-up adventures. Send pictures!